Last week’s post went over my usual three photo budget. So here are even more images that I didn’t include (and again I’m over budget!). The Air Force Memorial. (ISO 200, f/5.6, 14mm equivalent FL, 1/640 sec.). I was glad I had an ultra-wide lens. It all fits into the 14mm field of view from a close distance. The Potomac River at Great Falls. (4 frame panorama, ISO 200, f/4.5, 28mm equivalent FL, 1/1600 sec., color image converted to B&W in Lightroom). Although I grew up near Washington DC, I don’t remember ever hearing about the park until Lynn mentioned it on this trip. Ceiling in the Library of Congress. (4 frame panorama, ISO 200, f/4, 30mm equivalent FL). Our tour of the US Capitol included a stop inside the Library of Congress. I had to shoot from an awkward angle and stitch multiple frames together for this view. The Burghers of Calais – Sculpture by Auguste Rodin, one of twelve original Bronze casts, Hirshhorn Museum and Sculpture Garden, National Mall. (Infrared, B&W, ISO 200, 34mm equivalent FL, f/4.5, 1/320 sec.). I really like the way the IR camera rendered this, especially the bronze contrasting with the foliage. There are some very impressive sculptures in the National Mall in DC. You can read the fascinating background on this one at: https://en.wikipedia.org/wiki/The_Burghers_of_Calais. Washington Monument at dusk. (Olympus High Res mode, ISO 200, 62mm equivalent FL, f/5.6, 1/8 sec). There were hundreds (thousands?) of people just behind me at the Lincoln Memorial. I moved to the water’s edge to avoid most of the tourists and frame this view. I like the way this square composition shows off the symmetry. I also like the light and reflections – the last time I was in DC (2008?) the pool was a mess! After we left this time, we heard reports that the pool had been drained due to duckling deaths (www.washingtonpost.com/local/malls-reflecting-pool-to-be-…). More DC photos in this album on Flickr, – check ’em out! My dad’s been gone for many years. It would be so wonderful to visit with him again, give him a big hug, wish him a happy day and enjoy his company. And make a photo of us too. I grew up near Washington DC, and I’ve made many trips (both business and pleasure) to the area since then. So I feel somewhat qualified to offer ideas on photo opportunities in our nation’s capital. My most recent visit was last week. Lynn and I went to Williamsburg, VA to see Caroline (our niece & god-daughter) graduate from high school. We decided to go early so we could spend a few days as tourists in downtown DC. “Uncommon Valor was a common Virtue” – I was very happy when I saw how the light was falling as we arrived at the Marine Corps War Memorial in Arlington. I couldn’t wait to get off the bus! I probably don’t have to tell you that DC is a rich photo environment. Monuments, memorials, museums, history, art, architecture, gardens, government, and more are everywhere. But how do you get interesting photos, ones different from everyone else’s? Here are some suggestions. Try using an Infra-Red modified camera. I really like the way mine renders buildings against foliage and the sky. Take an evening guided tour: Lynn signed us up with the Bi-Partisan Tour Company for their “Epic Evening Tour” (thanks Lynn! ), and we both really enjoyed it. They took us around to great locations and allowed us to see them in a different light (dusk, blue hour, and night). I think it added interest to my photos. If you do take a tour, stay alert in the bus and watch for good vantage points as you ride. I spotted the Washington Monument behind the Jefferson Memorial and rushed back to make this shot when we parked while everyone else went into the building itself. It’s almost always crowded. You can try going in early on a Sunday morning, but if you’re there with everyone else you’ll have to use the people in your photos or find vantage points / ways to minimize them in your photos. I don’t know how many were at the Wall when we were there – it was elbow to elbow and had to be thousands. “Out of the mountain of despair, a stone of hope.” Martin Luther King, August 28, 1963. Ghostly figures move around the base of this long exposure photograph of the Martin Luther King Memorial at blue hour, with the Washington Monument in the background. If you go at night, be sure to take your tripod. It can be a pain, but my night tour images wouldn’t be nearly as good if I hadn’t taken mine. Contact your senators or congress person to arrange a tour of the capital (you’ll need to start months in advance). If that doesn’t work out, there are commercial ones available that will still get you a guided tour inside. Take wide or ultra-wide angle lenses. Building interiors don’t fit in the frame with a standard zoom. Before you go, practice making stitched panoramas. You can use this technique in place of an ultra wide lens. 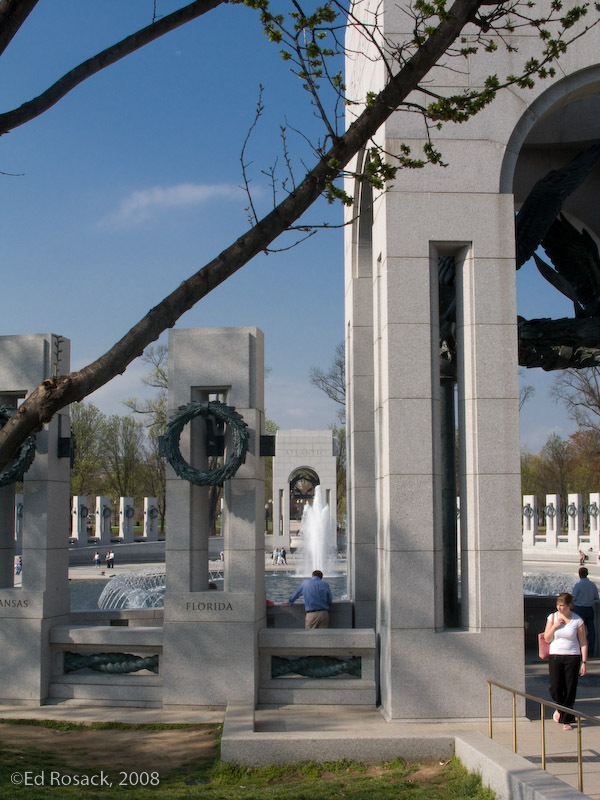 Stay in a hotel as close to the National Mall as you can. Parking is scarce and expensive. You’ll be walking or catching rides to get where you want to go. Wear comfortable shoes and clothes, and use your light weight photo gear. If you’re from Florida, you’ll appreciate the price of admission. All of the museums and monuments are free. Museum hours are usually 10am – 5:30pm. Lines were typically short, but some will require reservations (check first). You can visit monuments 24/7, but rangers are only available 9:30am to 10pm. You might have cooler weather in May or early June. It’s not as pleasant to walk around later in the summer with the temperature at 95 degrees Fahrenheit. You can spend many days (or weeks!) exploring DC. But if you run out of things there, Photo ops abound in the surrounding area. Two that I’d highly recommend are the Steven F. Udvar-Hazy Center just south of Dulles, and Great Falls Park about 30 minutes NW of DC. I’m collecting Washington DC photos in this album on Flickr, and I’ll add to it as I finish processing images from this trip. Please check it out! Thanks for stopping by and reading my blog. Now – go to Washington DC and make some photos! Germany and the Allied nations signed the armistice ending World War I in 1918 on the 11th hour of the 11th day of the 11th month. Armistice Day (later renamed Veterans Day after World War II) was commemorated for the first time on November 11, 1919. Thanks for stopping by and reading my blog. And if you’re a veteran, thank you for your service. The National Mall in Washington D.C. I had another opportunity to fly up to Reagan Airport early last Sunday for a business trip, and spend a few hours in downtown Washington D.C. on the National Mall. I brought my Olympus cameras, including my IR modified E-PL1. I’m really enjoying the way it lets me see things differently. So much so that I have to be careful not to over use it. I also brought an app I discovered for my iPhone: The NPS National Mall and Memorial Parks app is very useful – I highly recommend it if you travel to Washington D.C. And it’s free! Using the app, I followed the “4 hour tour” and saw several memorials that I haven’t been to, including the Franklin Delano Roosevelt Memorial, the Korean War Memorial, and the Martin Luther King Jr. Memorial. I also went by the Jefferson, Lincoln, and Vietnam War Memorials and of course – the Washington Monument. I was talking about my visit with my friend Patrick and he said something that really resonated with me: These memorials are named in honor of our famous founding fathers, or events from our history. But when you visit them, one thing you notice is that at each there are words / thoughts written in the stones that make up each monument. And it’s really these ideas that we should remember. Maybe a periodic tour of the monuments along with a test on every inscription should be required for members of congress. I was also surprised by how much color remained in the foliage – quite pretty. And I was grateful that the weather was so different from my last visit. This time it was partly cloudy and cool – very good walking weather. And just because I can’t resist, here’s one more IR photo. This one’s a false color image of a small Japanese Pagoda located near the Roosevelt Memorial. Japanese pagoda on the west side of the Tidal Basin, Washington, DC. Given to Washington DC city commissioner Renah Camalier by Yokohama Mayor Ryozo Hiranuma in 1957 and subsequently donated to the city. This pagoda may be from the Kamakura period (1192–1333). You can see other photos I’ve made in Washington D.C. in this set on Flickr.